Here at St.Emlyn’s we are big fans of Tranexamic Acid in trauma. We believe that it makes a difference to overall mortality in patients likely to be bleeding and also that there is some evidence that it seems to work across a range of illness severities. We honestly believe that as the evidence stands, at this moment in time, you should give it. CRASH 2 was a great trial and the evidence is there. Seriously. Use it, it’s great. Not everyone is convinced though. 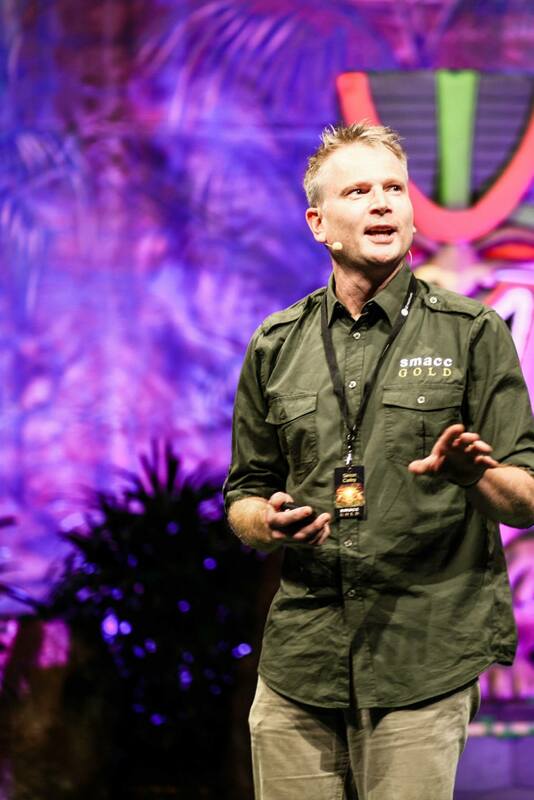 There is an RCT ongoing in Australia (Patch trial) and a number of other groups have raised questions too about whether we should be giving it to everyone and when. It was with this in mind that I came across a paper in the Journal of Trauma and Acute Care Surgery that questions it’s use in the most severely injured. The abstract is below, but as ever you should go and read the full paper if you can get access. What and who has been studied? The authors have questioned the use of TXA as their patients represent a different population to CRASH 2. One of the great things about CRASH 2 was that it took all comers in a variety of healthcare settings. This is great for generalisability but may lead to a questioning of results if your own local population is different. Fair enough I suppose and that’s what the authors of this study have questioned. Their population is older and their fluid/coagulation management policies are different to many patients in CRASH 2. This is their justification for a new trial of TXA based on their own institutional data. This is an observational study. Although the abstract states that TXA is used routinely, what that actually means is that it is used at the discretion of the surgeon. That’s not routine and it’s certainly not a randomised controlled trial design of the type that we normally look to in order to test therapeutic interventions. What they did was to take the 150 out of 1217 patients who received TXA (Ed – that’s not routine at all then) and compared them with matched controls taken from the 1067 that did not. At this point you can, should you wish, stop reading now. As a trial design this has many, many potential biases. It is highly likely that there would be judgements made between patients when discretion is used about the use of TXA. You can try and control for this by matching a propensity group but it is a poor substitute for an RCT design as matching can only match for what you match for (Ed – Eh??). Basically, matching in this way after all information is gathered (such as ISS) includes information that was not available to those making the decision to give TXA at the start. Whilst patients can be matched on scores (e.g. ISS) it’s not a fair match at the point of TXA administration. Patients who died within 2 hours were excluded. This is not an intention to treat design and again I can’t think of a good reason why they should be excluded. Actually I might be able to guess. The authors state that if the early deaths were excluded the results did not reach statistical significance. If they were taken out then the results became statistically significant (!). Patients were only included if they needed transfusion or operation. Again this is a subset of patients who would not be clearly identified at the point of ED administration. It’s fairly obvious to me that if you want to try and refute a large RCT in a more refined population then you probably still need an RCT. The results must be considered in light of the methods and the inherent biases resulting from the design and exclusion/inclusion criteria. Having excluded the early deaths the early mortality difference was 27% in the TXA group vs 17% in the non TXA group. That’s a 10% difference or a number needed to harm of 10. You read that correctly. The data here suggests that for every 10 patients you treat with TXA an additional death occurs. Gosh that’s an amazing difference and one which is all the more amazing when the difference in CRASH 2 was 0.8%. So the mortality difference in this study was different by a factor of 12.5 times (and in the opposite direction). That’s a massive difference and on its own questions the validity of the findings. The purported mechanism for this is that TXA may cause hypotension in this subset of patients leading to an increase in mortality. I’m sorry, but that just does not add up for me. This massive difference in mortality is much more likely to be due to methodological bias. What can we take away from this paper? To be honest not a lot. We have some great papers on the use of TXA in trauma and the standard of evidence is that we should give it. I implore you please to not stop using a cheap and easy to administer drug on the findings of this study. It’s not a great design, the patient selection is unrealistic of clinical practice decision making and the results are probably a function of these inherent biases. I suspect this paper can be explained as follows. Surgeons used discretion to give TXA to some patients. Those really sick patients did not do as well as some other patients that surgeons did not give TXA to. Critical appraisal is important and you can’t trust titles, it’s only by reading the methods that we can decide whether a study can give a fair answer. So keep using TXA. It’s great and until you see a well constructed (this isn’t) and well reported trial just keep using it. 1. The authors have excluded early deaths from their analysis. How might this have affected the results? 2. In the methods section the authors describe the use of a student t-test for continuous data. 2a. What is continuous data? 2b What does a students t-test compare? Thanks for the great post, Simon. Hard to understand how the authors (or editors) thought that these conclusions were valid. Clearly, an observational study can’t be used to refute a well done RDCT. It’s interesting isn’t it and I would not dare second guess the reasons, but despite the large RCT it still remains a controversial area for some. Arguably the biggest surprise to me was that TXA was not standard practice and that it was still down to discretion with a strong lean towards not giving it. In the UK the use of TXA in major trauma patients is a key performance indicator for major trauma centre performance, so we are clearly of a very different mindset. What’s the practice in your shop and around the world? Is TXA a routine med for your major trauma patients at risk of bleeding? Think the biggest surprise for me was that the editors ever chose to publish the paper at all. 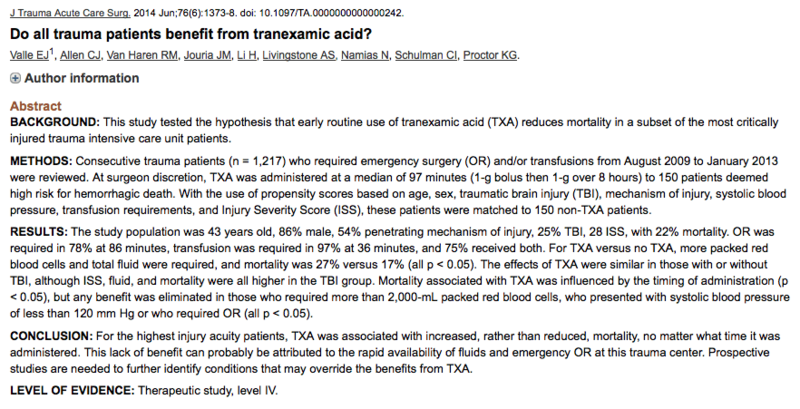 Whilst no doubt we may well see more papers looking at the use of TXA in trauma, I don’t think any others will use “surgical discretion” as a serious primary entrance criteria for a limb of a study.